The dry root of Polygala tenuifolia Willd., P. sibirica L. of family Polygalaceae. Shanxi, Shaanxi and Jilin provinces and so on in China. Collected in spring or autumn. The one drawing out the xylem by rubbing is called Yuan Zhi Tong. 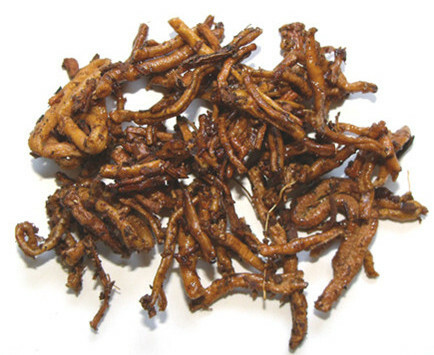 Yuan Zhi Rou is prepared by splitting the root bark and removing the xylem. The thin one with xylem is called Yuan Zhi Gun. Light smell, slight bitter and slightly pungent taste. Exquisite surface, big and thick skin and without wood. Removed soil, then dried in the sun to make the skin be slightly shrinkage, drawn out the xylem by rubbing, then dried again; unprocessed or stir-baked with liquid. Bitter, pungent, slightly warm; liver, kidney and lung meridians entered. Calm heart and induce tranquilization, dispel phlegm for resuscitation, cure abscess and relieve swelling. Being heart and kidney meridians entered, it opens heart qi to calm heart and induce tranquilization, and also collects kidney qi to reinforce will and memory. 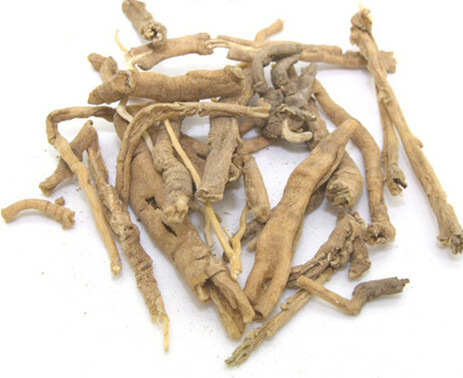 It is the key herb for restoring normal coordination between heart and kidney, inducing tranquilization, improving intelligence and reinforcing will. For unsteadiness of heart-mind, fright palpitations, upset, insomnia, amnesia due to disharmony between heart and kidney, it is often combined with heart-tonifying and spleen-nourishing herbs and tranquilizing herbs. For instance, it is combined with Ren Shen, Fu Shen and Long Chi and so on. It can resolve phlegm and induce resuscitation so it can be indicated for epilepsy, convulsions and mania-depressive psychosis due to phlegm obstruction of heart. For epilepsy, syncope, convulsions and spasm, it is often combined with phlegm-resolving, wind-extinguishing and spasm-stopping herbs. For instance, it is combined with Ban Xia, Tian Ma and Quan Xie and so on. For attack of mania-depressive psychosis, mental disorder, staring spells, it is often combined with phlegm-eliminating and resuscitation-inducing herbs. For instance, it is combined with Shi Chang Pu, Yu Jin and Bai Fan and so on. It has strong action of resolving phlegm and stopping cough and with lung meridian entered property. For cough with profuse phlegm, thick phlegm and difficulty to spit, it can be used singly or combined with herbs to resolve phlegm and stop cough, such as Ku Xing Ren, Bei Mu and Jie Geng and so on. Being pungent and with moving and smoothing characteristics, it can dissipate swollen abscess by smoothing obstruction of qi and blood. It can be indicated for kinds of abscess, deep-rooted carbuncle and swollen sores, such as cold syndrome, heat syndrome, deficiency syndrome or excess syndrome. It is effective both taken orally and applied externally. It can be used singly in powder with yellow wine or ground with yellow wine for external application after steamed. Decoct 3~9 g. Take proper dosage for external application. It should be used with cautions for excess fire or phlegm-heat because of its warm nature. It should be used with cautions for gastritis and duodenal ulcer because it will stimulate stomach and intestine.